How to get there: One should climb this (secondary) peak together with Castle Peak. The approach to both peaks is the same. A natural starting point is the resort town of Aspen. Just north of town, on the main street, there is a new traffic circle. Go around it and take the last exit (before returning to Aspen), called Castle Creek Road. Drive up the valley along this road for about 21 km, the dirt road going right is clearly marked (there is a sign saying "trailhead parking" on the right immediately before the road starts). (Actually, the main road was closed to traffic at this point as well, but I guess that was temporary.) The dirt road quickly becomes a 4WD road, it goes all the way to 3900 m, but there is good parking around the second creek crossing at about 3350 m. We parked there in order to make the clim b have reasonable gain of elevation. Route description: The first part of the route is the same as for Castle Peak (see description there), we climbed this peak from Castle Peak. 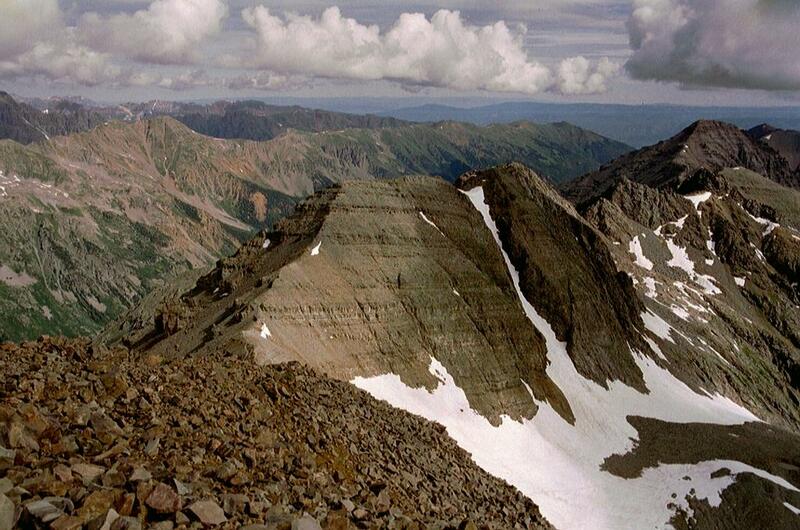 From the summit of Castle Peak, head down the north-west ridge towards the saddle between Castle and Conundrum. There is a clear trail and no difficulties. Once in the saddle, proceed up the connecting ridge to Conundrum. Again, there are no particular difficulties. Our return route can also be used as a direct route to Conundrum without the climb of Castle Peak. Return from Conundrum to the saddle, then descend on a fairly easy scree slope to the permanent snow field. This snow field is less steep close to the Conundrum side, we could easily hike down without any snow equipment. Clearly, there may be times when an ice axe and possibly crampons will be helpful. Comments: I did this climb with Pål Jørgen, age 12. The Conundrum peak has two summits separated by the top of a distinct (snow) couloir that comes up from the basin below. The first summit has a cairn and the summit register. However, Gerry Roach refers to the second summit as being the highest. We climbed both summits and based on the simple test of checking if you can see across a summit to the horizon behind, it seems like the first summit may be the highest. It can be added that the word "conundrum" means a difficult question or paradox to which no easy answer exists. Conundrum Peak, as seen from Castle Peak. Note the snow gully between the two summits. It appeared to us that the left summit was indeed the highest.